Download here. 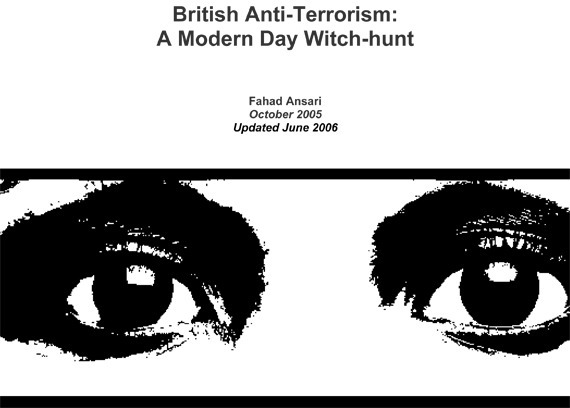 On the eve of the first anniversary of the London bombings, IHRC are releasing an updated version of British Anti-Terrorism: A Modern Day Witch-hunt, a study of the application of the anti-terror legislation in the UK since 9-11 and its implications for the Muslim community. The new edition of the report by Fahad Ansari contains updated statistics on anti-terror arrests in Britain, details about the new Terrorism Act 2006 and an update about the plight of the original Belmarsh detainees. From internment to control orders, proposals to ban Hizb-ut Tahrir and other Muslim organisations to extradition, new legislation and police powers, this report covers the gamut of the British government’s latest anti-terrorism proposals. This clear analysis not only makes the case that the government’s anti-terrorist strategy violates basic human rights and curtails civil liberties, it powerfully argues, that it is also counter-productive. Using case studies, Ansari relates in graphic detail how these proposals single out Muslims and the Muslim communities in Britain, equating it with a latter day witch-hunt. Available to download without charge in PDF (after 2200 GMT) by clicking on the link below. If you want to order a spiral bound, plastic cover copy (£6 including postage and packaging), please go to the IHRC shop.